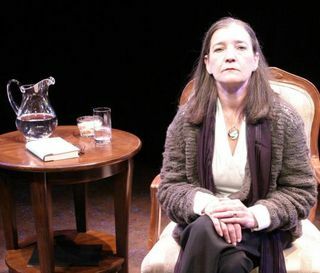 The play, adapted from Joan Didion’s celebrated memoir of the same name, explores the author’s psychological experiences as she copes with the sudden death of her husband John Gregory Dunne in 2003, while simultaneously facing the grave illness of her daughter Quintana. For those who haven’t read the memoir, The Year of Magical Thinking was written the year Joan Didion’s husband died. It is raw. It is internal. It is grief splattered out on the page in all its messy hurt and fear and anxiety. The first time I encountered the book, I was enrolled in a trauma seminar and we read it for the sole purpose of discussing how a writer handles grief on the page. When I saw that Didion had transformed her memoir into a play, I found it incredibly perplexing. The question: How the hell can you transform such an internalized narrative into a series of actions depicted on stage?? Today, writers, I offer you a writing exercise I adapted from the Poet and Creative Nonfiction writer Lisa Chavez. (it’s related to the above story, I swear.). Take a scene you are working on. Maybe you are struggling to revise it or maybe you are struggling to write it. Write the scene as a play (or if you are writing a play, write it as a narrative scene. If you are writing a poem, what the hell, try it anyway). Don’t forget to include things like stage directions, stage props, character descriptions, etc. I particularly like doing this exercise when I know I need to have characters interact dramatically, but I’m at a loss for what they will actually say. Bring what you’ve learned back to your original attempt. On a final note, those in the Albuquerque area, if you are at all interested in watching this play, there is a pay what you will day on May 1st. Let me know if you want to go! And for anyone who doubts the usefulness of or possibility of turning a poem into a play–we just had that as an in-class exercise in my playwritng class Wednsday, with some very beautiful short plays coming out of it.